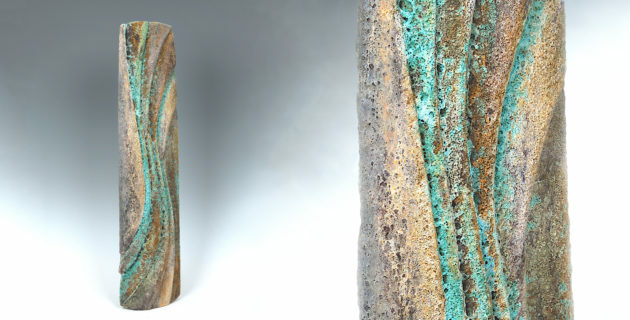 Wendy Lawrence received a BA in 3D design (Ceramics) from the University of Central Lancashire in 1998, and has since taught ceramics and run workshops for schools, colleges and community groups. She has participated in symposiums and workshops in Britain, Europe and America and was a guest artist at the International Ceramics Festival, Aberystwyth, in 2003. She is interested in textures of natural geological forms which she observes on her walks in North Wales where she lives (Denbighshire). She experiments with glaze using highly reactive substances to create rich textural surfaces to evoke the natural structure of rock strata. She fires the work to 1260 degrees C in an electric kiln, varying the atmosphere from oxidation to heavy reduction. 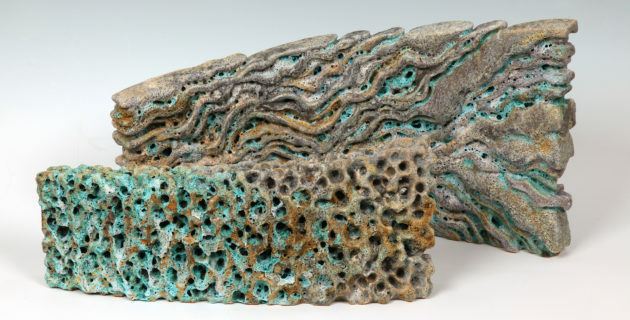 “My ceramics are elemental and volcanic, attempting to exaggerate form and texture evident in the geological process. Textures and colours are intensified; framing nature’s characteristics within each piece. I live near the coast and mountains of North Wales – immersed in geology which continues to be my focus. This interest has evolved into an appreciation of natural form and texture in its entirety. I have been documenting geology, form, surface and texture through drawing, photography, collecting found objects for years. 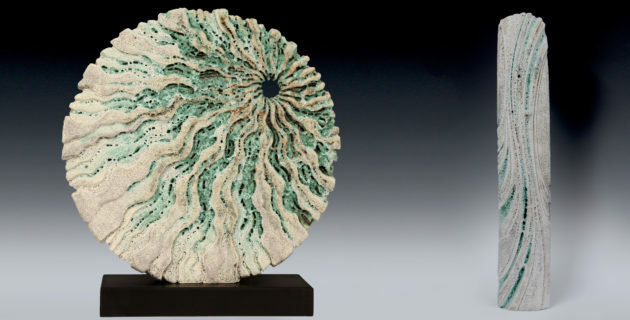 My work is also inspired by monoliths, stone circles, troughs and wheels: forms that capture the majesty of stone. I enjoyed the spontaneity of the clay to begin with, bashing and pummelling clay into trough like forms. My work has evolved gradually and is becoming more textural and carefully carved. I make for the enjoyment of the material, alongside the desire to express the qualities of stone and therefore have a variety of hand building techniques. I gouge out solid pieces, slab build, coil, drape slabs into moulds and formers and carve solid pieces of clay. My latest work combines the simplicity of form and textural carved elements found within erosion, focusing on sculptural pieces which are no longer a surface quality but become part of the form itself. I use a variety of different volcanic glazes which I multi layer onto the ceramic pieces. I also add Oxides: Copper, Vanadium and Titanium under and over the glazes. Silicon Carbide in the glaze creates a gas whilst firing and this creates the bubbles and blisters. The multi layering of glazes and building up an un even surface over the heavily carved clay further amplifies the volcanic look but also creates a sense of ancient rock and natural erosion. My work is displayed in interior and/or exterior spaces. When I completed my degree, I gained a Post Graduate Certificate in Education and continue to teach all ages and abilities. Teaching has been a wonderful way to continue my own learning and sharing my knowledge with others no matter what age or level is a real privilege. I am currently teaching Ceramics on the Applied Arts Programme at Glyndwr University in North Wales. I enjoy living in North Wales for many reasons, the landscape is a predominant factor but also the collaboration of friends, colleague’s and creative partners.